All of my “granola intentions” were mostly just that intentions. We ended up inducing, which meant that at a certain point my contractions were so strong I couldn’t focus anymore, but my body wasn’t at the point of delivery— let’s just say I had another 4+ hours after that point, so I opted for the epidural. My doctor actually had another woman giving birth at the same time as me, so the midwife was running back and forth between the two rooms, and at a certain point after the epidural, a doctor came and sat with me for what seemed like an hour just with her hand on my stomach monitoring my contractions— it was soothing and nice to have someone just sit there with me, and I don’t if I would have expected that type of attention in the US. She said she was surprised I lasted as long as I did without the epidural, and that I let it wear off once so I could get the contractions to kick in and help things move along. 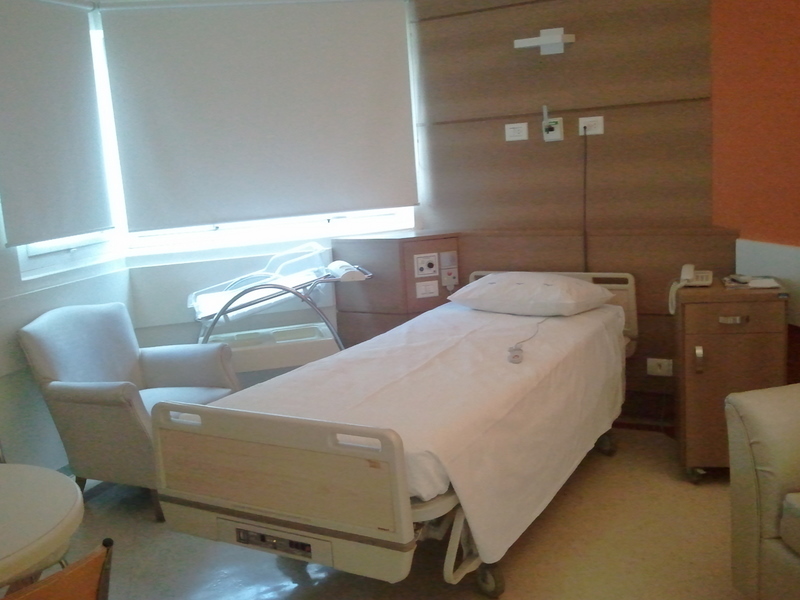 From what my doc said, those who do parto normal in Brasil get the epidural’s early on in the process. When it finally came time to deliver a nurse pushed me through the door (bumping the frame) down the hall (bumping over the door frame bumps on the floor) and into the surgery room. Then I had to scoot myself onto the table, as they adjusted my legs (strapped in) on the stirrups (twice), and tilted me downward. I told the room that had I not opted for an epidural, at this point in time I would have wanted each and everyone of them dead. Seriously, it would have been awful to be at this stage and being moved. My husband wasn’t around for any of this, because well he had to be sent to a totally different floor to put on his surgery clothes. And since he had brought his laptop bag and I a backpack with random “labor stuff” for the 9 hour labor, he had to also run all of that up to our room, as we were told we couldn’t just leave it in the pre-labor room. He ran into the room as I was making the first push, and the anesthesiologist was pushing on my stomach. I politely said “really do we have to push on my stomach?” and he walked away, so no big deal other than they tried to push my baby out for me. They did cut me, and there were like 10-12 people in the room between 2 obgyns, midwife, nurses, anesthesiologist, and the pediatrician. I got to hold the baby, then they took him to get cleaned and weighed, and then he was brought back a few minutes later to nurse and bond with me. After that I was told we would go upstairs and he to the nursery for the next 2 hours to do all of the “baby stuff” that comes after birth… which wasn’t the 4 I had been told, so that was nice. 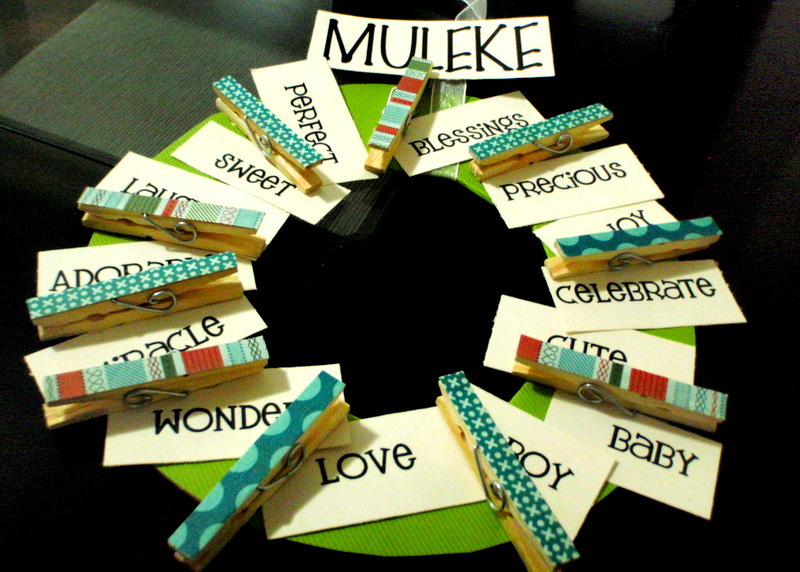 Either way, I’ve have a wonderful, sweet little bundle of joy… finally! Posted in Pregnancy and tagged Having a baby, Hospital Albert Einstein, pregnancy. Bookmark the permalink. Nothing to do with Brasil, other than the fact that I’m having a baby here, and so I thought this video was funny if you haven’t already seen it. Ok and maybe the note that while I’ve been donning flats and Haviannas, most of the Brasilians I’ve seen have no problem wearing tall heels as shown in this video. Is it wrong that I spent 30 percent of the time thinking, man her feet must kill, and the rest thinking, no way would I put my fat pregnant arse in that outfit for everyone to see. So on these hospital visits I found two things. The first was noticeable that every door of the hospital rooms had a wooded or cloth plaque/decoration with the babies name on it. In Brasil, people know what their child is to be called, WAY before they’re born. In fact, most people find it odd that I don’t have a name for my son yet. We’ve just been telling our nanny to refer to him as “Lief” although that is DEFINITELY not the name we’ll use, we just find it funny. These door signs are intended to be brought home and used for the baby’s room as well, so thus why they’re a bit more permanent. Of course my husband thinks that having something on our door is absolutely ridiculous. For a few reasons. One our kid doesn’t have a nursery yet, as he’s sharing our bedroom until we move. Two, it’s not like we’re gonna have a whole bunch of people visiting us at the hospital, since we’re a bunch of anti-social folk 😉 and we’re not Brasilian. The other hospital tradition I learned about was lembrancinhas. While waiting for the valet, my son tried to dive off the back of the sofa. A nice lady and her daughter helped me out as I’m pregnant, and people in Brasil help prego folk out when their kid’s being a bit of a rascal and your husband is grabbing the car. In fact, the little girl reached into her mom’s bag and pulled out a little cupcake with a fondant baby on top, and a chocolate ganache cupcake on the bottom. Interestingly my son immediately knew it was a treat, opened it up and devoured the fondant baby head (creepy I know). This cupcake was a lembrancinha that the family hands out to the visitors. 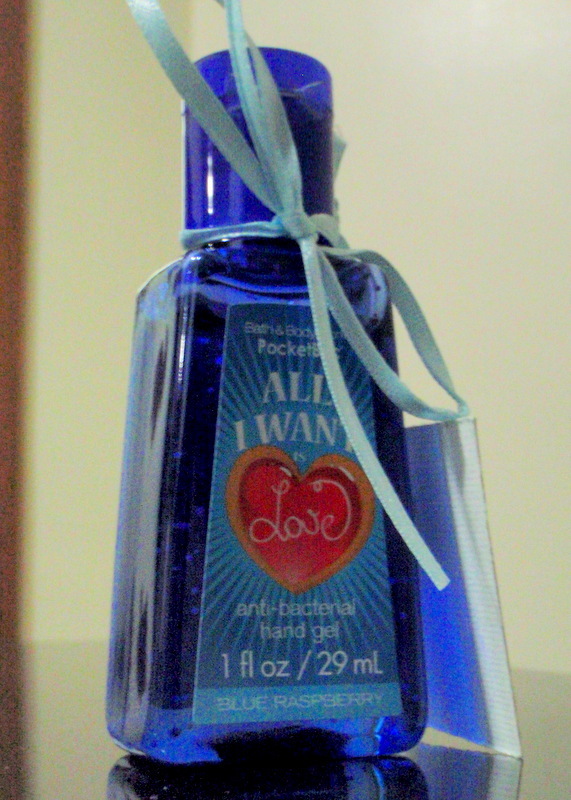 In the US, you usually have little gifts for the nurses and such at the hospital, but not normally things that get handed out to all guests that visit. Again, luckily we’re not Brasilian, so I doubt many folks will be visiting us anyway…but I guess I’d better get started! Posted in O jeito Brasileiro, Pregnancy and tagged lembrancinhas, pregnancy, traditions, Unique to Brazil. Bookmark the permalink. So I went through the list of Doula’s in Sao Paulo, and emailed them in Portuguese in English searching for an English speaking Doula, and found two. Raquel Olivia and Cris Toledano. I also found GAMA and Ana Cristina a midwife (who from readings seems to be the other English speaking popular expat midwife in Sao Paulo other than Marcia from Prima Luz). They told me that I needed my doctor’s approval… um okay that’s kind of weird… this is my birth, I can have whomever I want right?! ha, this is Brazil everything is mandated by some obscure law. In fact in 2006 they passed a law saying hospitals had to allow a woman the right to have someone with her. Random right? Albert Einstein in fact allows Doulas up until the birth part, and then they cannot participate. So I had a list for my doctor on what she would let me do about natural (when I say natural she hears vaginal I’m sure). I generally got the impression from the answers that my doctor has one idea in the back of her mind, and is totally happy telling me everything she thinks I want to hear… my husband says I’m a crazy hormonal, paranoid pregnant woman…. maybe, we will see. Can I have a Doula? I only work with Midwives (that’s the Brazilian way of making it hard on me, and the short answer is no). Marcia Koifmann was out of town, and Ana Cristina only delivers at Sao Luiz… So meeting my doctor’s midwives at my next appt. Good thing I have super expat insurance. Can I eat once admitted? 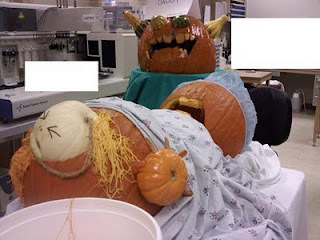 Yes eating and drinking until you get the epidural.. again with the epidural. Can I keep the baby with me after birth? 30 minutes of bonding time, and then 4 hours where neither you or the father can be with them other than looking through a glass window! What do you put in the baby’s eyes? Silver Nitrate, and regular antibiotics are not an option… for the record the US switched to antibiotics like 10 years ago…tho Sao Luiz said something about lasers??? When will you show up? When you are 7cm. Midwife when you get to the hospital. What about the baby pediatrician? If you can get the neonatalagist to sign off on it and take responsibility should something happens, sure (again Brasilian no there). Does that increase with C-section? Nope- 3 days. Do I have to use stirrups and lay on a surgical bed? Umm yes it’s the only way. In fact, she looked at me like I was speaking Chinese…. yes people you can deliver a baby in other positions. Like maybe I want to stand on my head or something, heck if I know what I’ll feel like, but I don’t want to be told I can’t… I’m a bit stubborn. The reality is my husband is not into natural births. He thinks I’m a granola eating nut job. I’m actually doing hypnobabies home study right now, so we’ll see how effective that is… and yes maybe I’m a nut job. But my mom had 5 kids naturally and said it was no big deal…. so I’ve got to be able to do this. I have to say after the above conversation I am even more invested in making sure I have this birth 100% natural. There’s now a level of stubborn pride attached to this whole birthing in Brasil adventure. Either way, I’m not meeting all of her Midwives (4 of em, 2 speak English, and one REALLY speaks English), so hopefully my paranoia will dissipate. The first Midwife pointed out that all of the women in the public hospitals have babies naturally. . .
*UPDATE* I get a lot of questions from individuals on this, so I assume like me it is a hotly Googled topic. Deleting cleaning up some of my old files of baby prep in Brazil I found the following links on natural childbirth that I found useful … and hope you do it. I left in Google Translate to English for everyone’s convenience. Posted in Expat Life, O jeito Brasileiro, Pregnancy and tagged Albert Einstein, Brazil, doulas, Having a baby, midwives, perspective, Unique to Brazil. Bookmark the permalink. So Albert Einstein is supposedly the best hospital in all of Brazil. With traffic it’s like an hour to half an hour from us. Notice I started with an hour, as there is always traffic here in Brazil! So thus why we debate should we have the baby at Albert Einstein. Experience of Motherhood Albert Einstein, for example, reveals that the CS rate was 18% among 239 women who had opted for the LDR between April 2000 and June 2001, and 195 normal births occurred in this group of patients. Yeah, Albert Einstein has 4 Labor AND Delivery rooms. 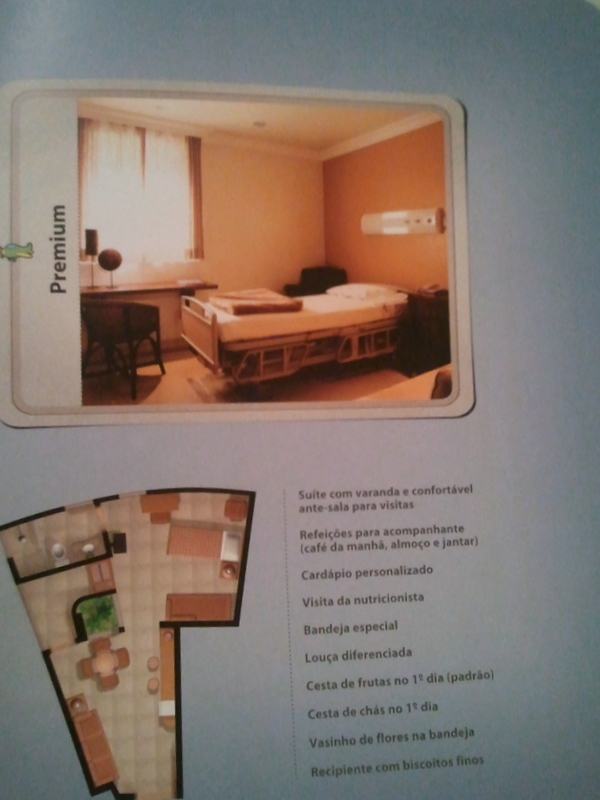 Unlike Sao Luiz where it’s just Labor rooms, you may actually get lucky and get an L&D room, and then the C-section rate is lower than the rate I faced in California (30%). I was all excited to see the hospital today and make the decision… but as per the norm in my life they called at 9:30 for our 11am appointment letting us know every room, every surgery room, and every Labor and Delivery room was full up. Seriously, is this what I’m going to face if I choose them? Also, in a frantic paranoid state I googled when people in Brasil schedule C-sections. In the US it’s usually Mondays (fyi). From googling in Portuguese- seriously honing this skill- it seems Thursday/Friday are the preferred C days here. Then the doc has the weekend off, and the family has the benefit of friends and family not working and being able to visit in the hospital. So this baby be born mid week darn it!! 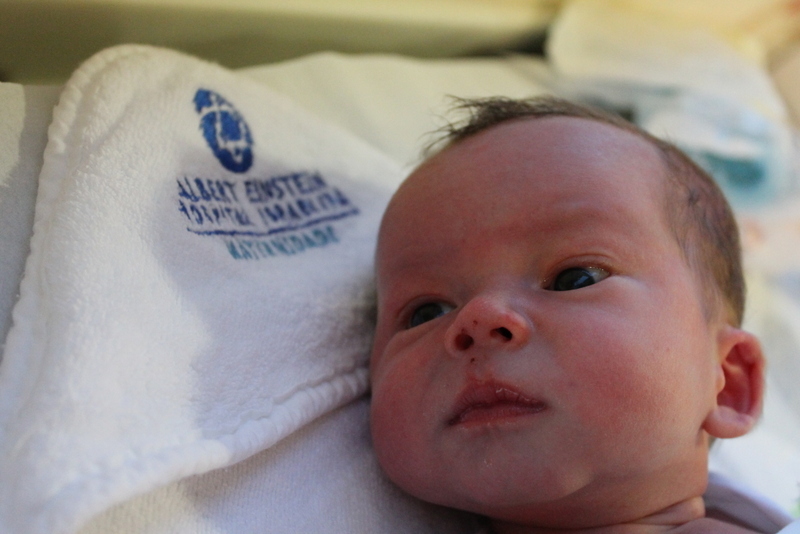 Posted in Expat Life, Pregnancy and tagged Having a baby, Hospital Albert Einstein, pregnancy. Bookmark the permalink. 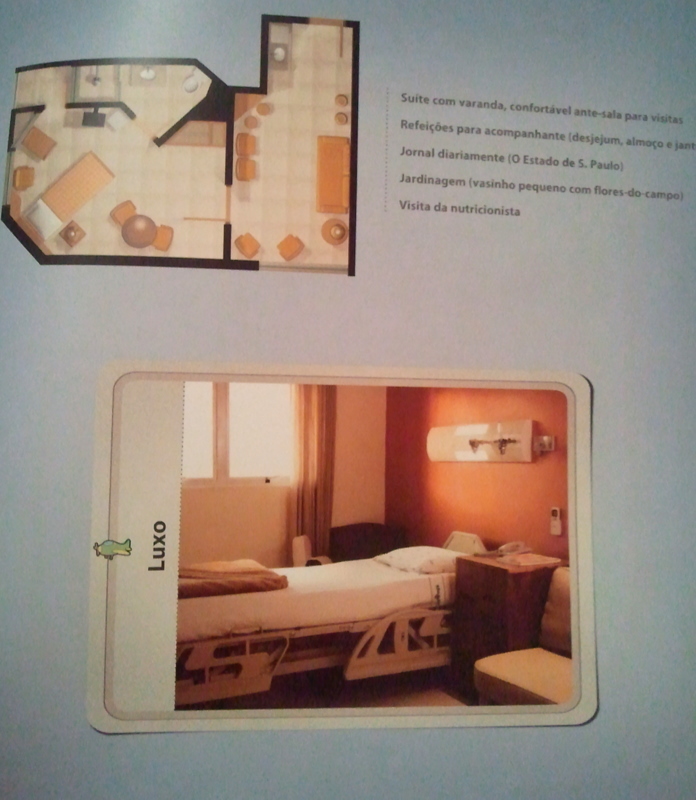 So I previously blogged a bit about the hospitals. But today we visited Sao Luiz. It’s down the road from us, so convenient, and we know nothing about how things work here, so it was helpful to go and get their pamphlets. 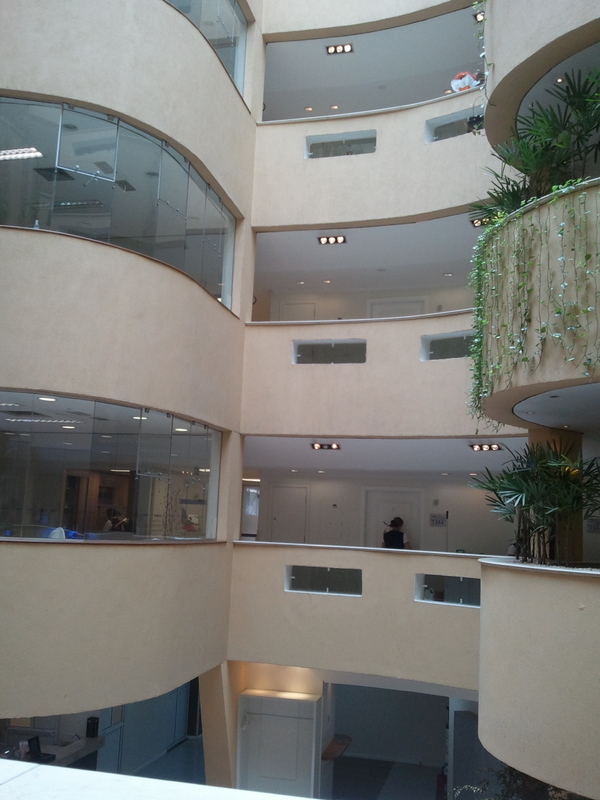 Umm wow, so there is a whole entrance lobby area just for maternity— it is a maternity hospital, so that makes sense. I didn’t see a bunch of pregnant women being wheeled around in wheelchairs, most walked in and sat down for an incredibly long time and seemed to be filling out paperwork. But overall, it was very posh. Heck, just to get onto a maternity floor you had to pass a security guard (they love those security guards here in Brazil). There is a Cartorio in the hospital, so you just go down to them with the certificate of live birth and your official or notarized copy of your marriage certificate, and walla you’ve got the birth certificate process completed. The labor and delivery has two entrances… ala Brazil birthing of course. One is the labor rooms (8) and the other is the C-section entrance. Yeah, there’s no hiding the elective C here. 2 or the 8 rooms are for “natural” laboring. i.e. there is a tub you can relax in and a birth ball, and music. I take it these 2 rooms are probably nicer. Of course they still then ship you off to the other side (C world) to do the delivery in an operating room. Hubby has to go up get sanitized, and then can join you. Post birth, the baby, a nurse, and a security guard step into the elevator with your child. Your hubby can then run up the stairs if he’s crazy (like us), or catch the next elevator to the bercario (baby nursery). Mom’s drugged up or being wheeled off to who knows where they never mentioned that part…and I forgot to ask. Babe sits in the bercario for 3-6 hours … depending on when the mom is finally situated in her room and ready. I didn’t take photos of other peeps kids, but there were only like 3 newborns. I think I may bring my pampers, as they all seemed to be using these awful plasticy blue diapers I bought once that gave my kid a rash. Now for the rooms… umm okay. 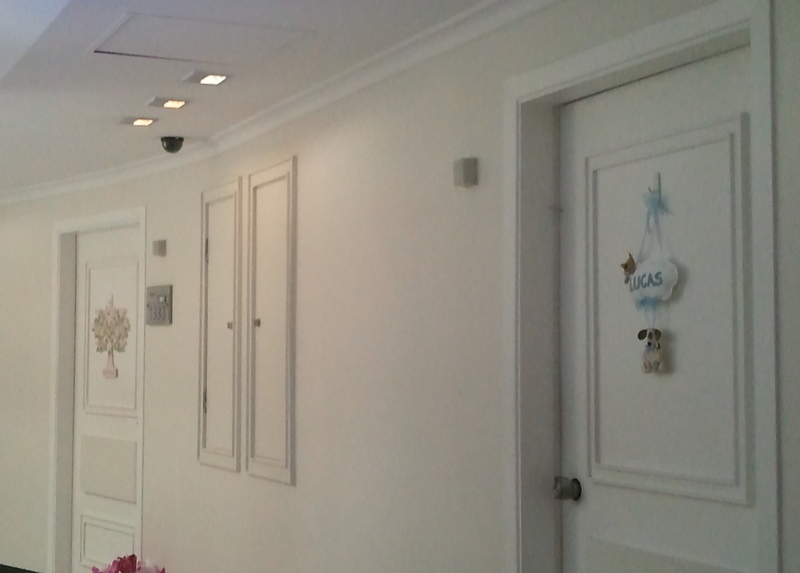 We gave birth at Cedar Sinai and saw their nicest rooms. .. and of course where half of Holywood had their babies. 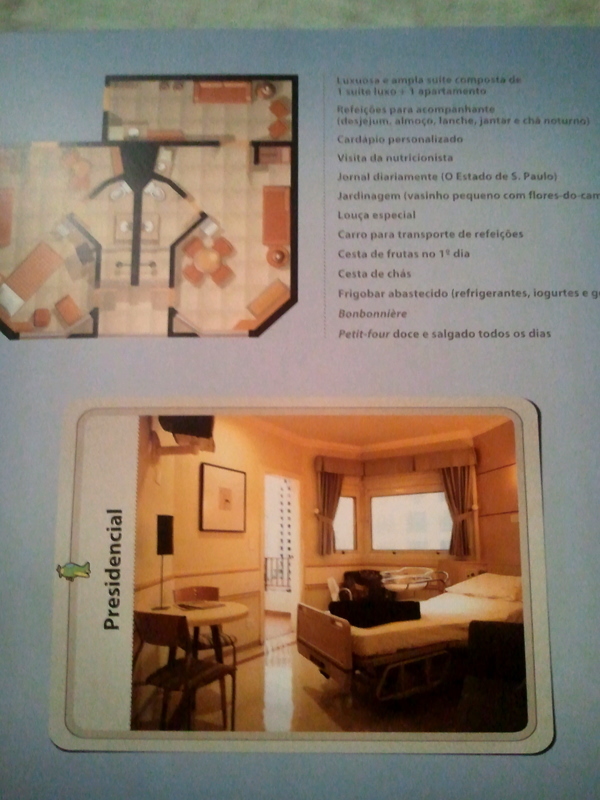 Now let’s compare that $3784 a night room to the following R$1010 a night room. 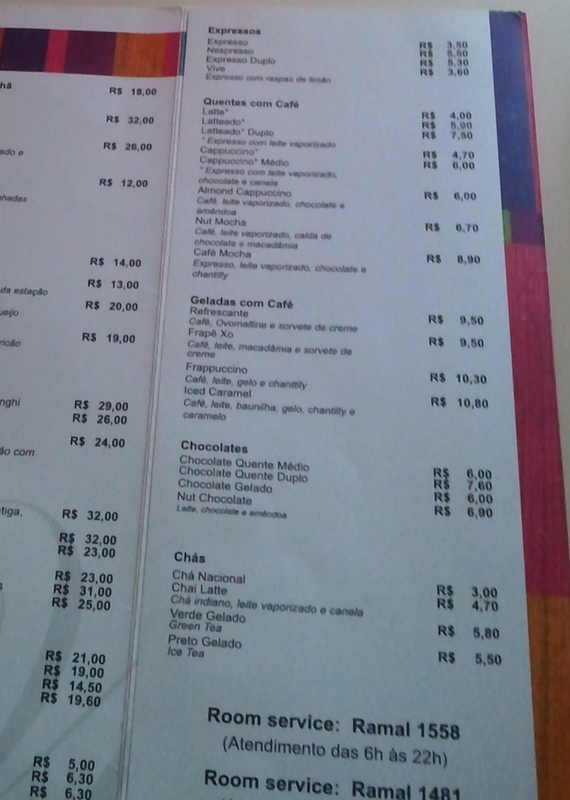 Um seriously Brazil has got this whole pamper the mom thing down… for cheap. Not sure who I’d put in the other area… my posse? And to the most basic of rooms, which is huge. My husband noted the comfiness of the sofa bed compared to the pathetic cot he was given to sleep on at Cedars. I noted that the bed actually laid flat. I hate that about US beds. I couldn’t ever just lay freakin flat. 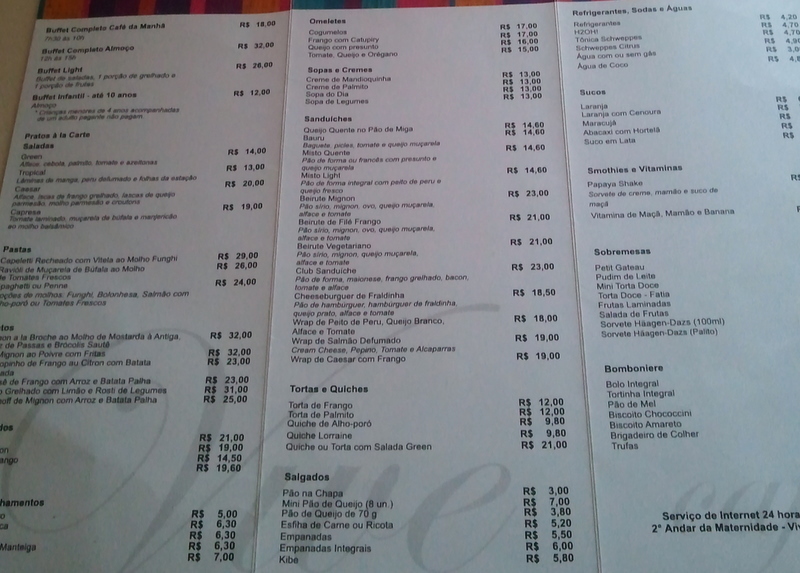 Food wise, you either order, or the nicer rooms come with free meals, up to free petit fours and tea, etc. The photos above list what the “extras” are with each room. 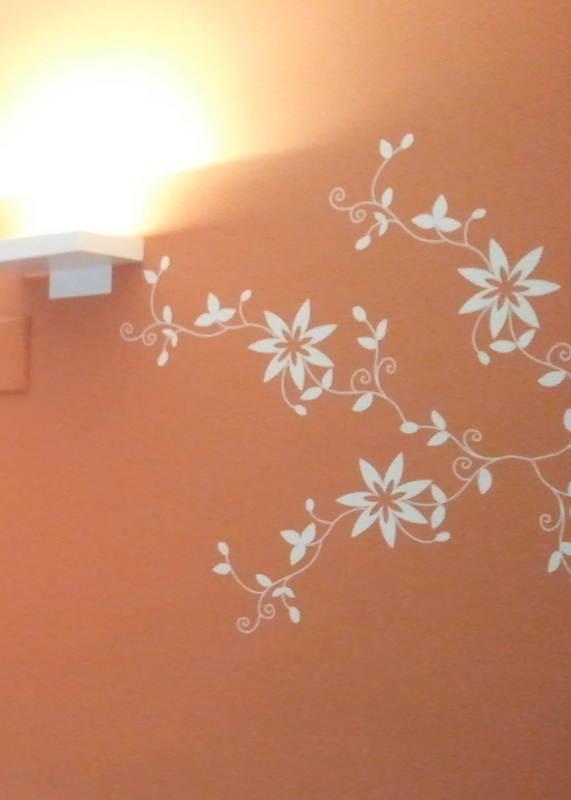 Also, love that the walls are not just hospital white. Way to bring in that Brazilian spice. I know SUPER SUPER long post. 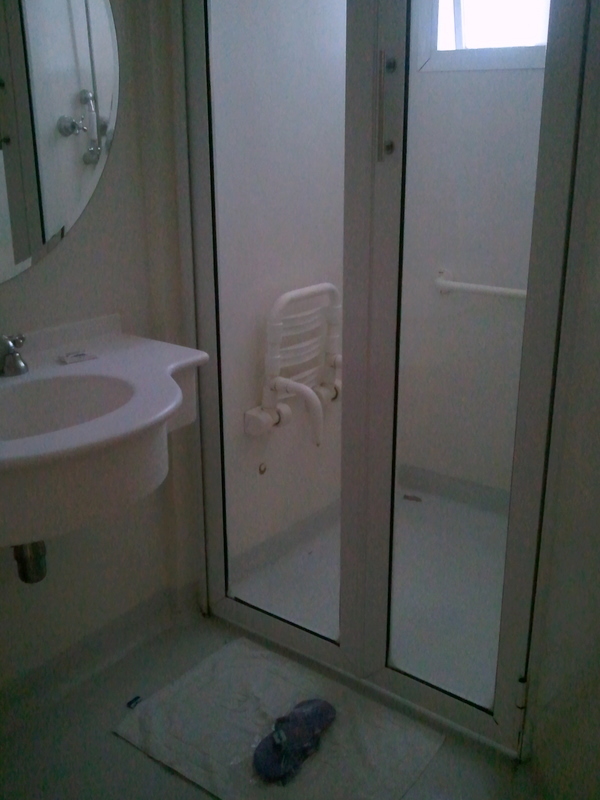 Finally the bathroom. Note the complimentary slippers. Which I found ironic, since they provide those, but the tour guide told me to bring my own pads for the post bleeding. Seriously, why the heck wouldn’t they provide pads? She also told me to bring my own clothing.. again I find it hard to believe I couldn’t sit in a hospital gown… but she probably finds it hard to believe any self respecting Brasilian woman would want to right? 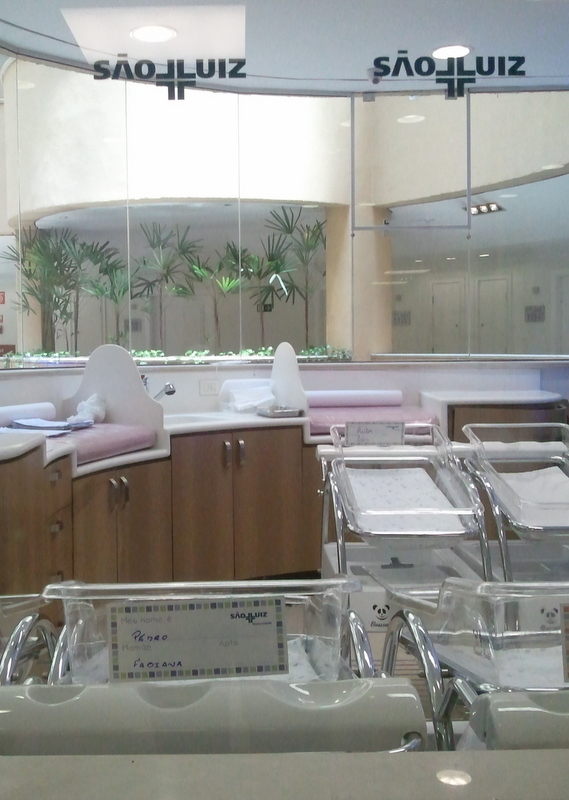 Posted in Expat Life, Pregnancy and tagged Having a baby, Hospital Sao Luiz, Maternity Hospitals, Unique to Brazil. Bookmark the permalink.